Unitarian Universalist Association of Congregations The Unitarian Universalist creed lays out seven principles by which its members are asked to live. Eight years ago, the seventh principle, respect for the interconnectedness of all things on the earth, became the foundation for the greening of the organization's meetings. "At our meeting in 2003, members of the Seventh Principle Project asked me to green the General Assembly," recalls Janiece Sneegas, director of the General Assembly and conference services for the Boston-based Unitarian Universalist Association of Congregations. "I thought, 'We're not going to be able to do this to anybody's satisfaction.' "
She was wrong. In fact, over the years, the UUA convention has become one of the most environmentally friendly gatherings around. While Sneegas uses green protocols in her selection processes, and the group prefers cities that have a sustainability track record, "we also recognize that part of our work is helping other cities to take the next step on their own paths," she says. Accordingly, the 2013 General Assembly will be held in Louisville, Ky., where such practices aren't as ingrained. "They speak commitment, but we'll see when the rubber hits the road how willing they are to partner with us," Sneegas adds. A food-donation requirement was added to the 4,000-person meeting in 2006 in St. Louis, and fully green contracting was added for the convention in Portland, Ore., in 2007. Earlier this year, when the group went to Charlotte, N.C., the UUA asked that 5 to 15 percent of the power supplied by the convention center and hotels come from a renewable source. "The other thing we were able to do in Charlotte was maximize the front-of-the-house composting by setting up composting stations in the food court," says Sneegas. "Also very cool was that they agreed to have their vendors switch to compostable serviceware for us." 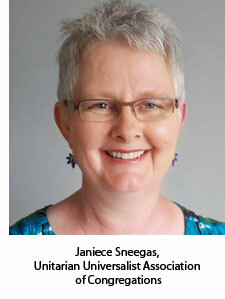 Going green has never hurt the UUA's bottom line, Sneegas reports. The only area for which the group has paid extra is in food and beverage -- specifically, to use more organic and local foods. In this case, the UUA's "ethical eating statement of conscience," which was passed last year, trumps the budget. Sneegas explains, "Our contracts require 20 percent of the foods to be organic and local at no extra cost, but if the vendor can do more, we'll pay for the difference." Sneegas is happy that she no longer gets the amount of resistance that she once had to fight against, though some suppliers still drag their feet a bit at providing green services. "We're not interested in hearing suppliers tell us what they plan to do," she says. "We're interested in hearing what they're doing."